I prefer using Norton Antivirus for my virus scanner but there are instances where the installation fails or the software becomes damaged later on. You’ll then need to uninstall it before you can re-install it. Another reason to remove Norton could be the subscription for it expired and you don’t want to buy the latest version for another year of virus definition updates. 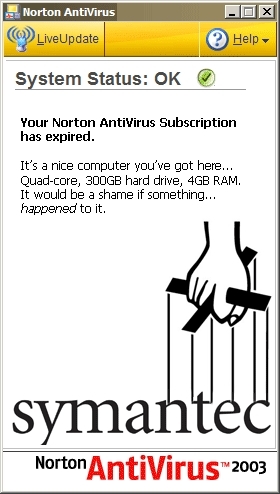 The problem here is that if you try uninstalling Norton, not everything gets removed. I’ve seen services that are left behind that communicate with the Symantec web site. There have been many complaints from former software users about their failed attempts to remove the virus scanner. A guaranteed way to remove Norton is to reinstall your operating system, but this is a job which could easily take a day to install Windows and all of your applications. Dave Taylor posted How can I fully remove Norton Antivirus from my system? on his blog. While this is an effective solution, its not meant for inexperienced computer users. The first part of the solution is simple: Norton is uninstalled through Add/Remove Programs in the Control Panel. The second part involved is making changes in the registry with Regedit. This is where novices will become confused. An easier solution is to use the Norton Removal Tool from Symantec. This will remove all Norton products from the 2003 to 2007 versions. If the removal tool doesn’t succeed, you’ll have to use Dave Taylor’s solution to uninstall Norton Antivirus. The complex process involved in uninstalling Norton Antivirus shouldn’t be necessary. Symantec should include the software to completely remove the antivirus software and all of the services that get installed with it. What they have succeeded in doing is frustrating and alienating many users who probably won’t use other Symantec products after this. Applications should be easy to install, use, and uninstall. The time spent in producing quality software will retain your customers who will also refer it to their colleagues. Symantec has good products but they need to put their customers first when developing software for them.